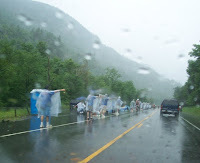 Another Ironman Lake Placid is under our belt, with no major problems or incidents. Today's photo features the people without whom the event simply would not happen: volunteers. Kudos to those hearty folks who braved Sunday's torrential rain to help out! Without them, the Adirondacks could not host such a well-run and great event, nor could the event owners enjoy the great success they've experienced with Ironman Lake Placid. Such success, by the way, that it takes real planning to be allowed to participate in an Ironman Triathlon in Lake Placid. Next year's race was sold out from on-site registrations on Sunday! Apparently, Lake Placid is a pretty nice place to hang out, whether you choose to torture your body in an athletic competition in the pouring rain or sip tea on the deck. Check out the Ironman Lake Placid 2008 results here.